I have to give myself a budget at the farmer's market because I tend to go a little crazy there in the summer. It's all the smells, you see, and the colors that make me lose my head - the tiny red strawberries and the golden blush of peaches and apricots, side by side with boxes of fragrant basil, shiny yellow squash and sweet peppers. Everything calls out to me, the asparagus and the big white leeks, home-made hummus, local goat cheese and honeys, and humble cucumbers, not nearly as straight or perfect as at the supermarkets and therefore more beautiful. But the one thing that I can never pass by are tomatoes. 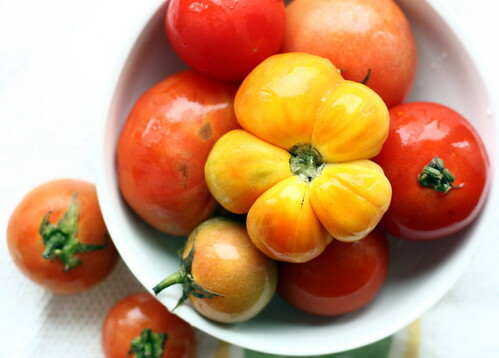 Summer tomatoes, to be specific. They are a story onto themselves. As soon as I saw these, I knew that they must be made into mini tarts for our lunch today. I could almost taste them, sweet and juicy and warm from the oven, encased in a buttery Parmesan and herb crust. The crust is not difficult to make at all, do not be afraid of it. The whole wheat flour and the Parmesan take it to another level, and the smell of it as you are making it, and as it's coming out of the oven is kind of insane. I mean, you want to stop right there and just break off the crunchy, herby pieces that give off that unmistakable and irresistible scent of toasted cheese. But then you top them off with the goat cheese and the tomatoes, and add a bit of really good salt, and you'll be just so, so happy that you waited for the whole thing to come together. A nice glass of cold, crisp wine finishes these off perfectly, and though I was not able to enjoy them in exactly that way, it did not for one second detract from their deliciousness. Whisk flours, salt, Parmesan and herbs together in a large bowl. Cut butter into small squares and scatter on top of the dry ingredients. With a pastry cutter, quickly cut the butter into the dry ingredients until the biggest pieces are no larger than a small pea. Dribble in water, one tablespoon at a time, until the dough holds together when pinched. Refrigerate for ten minutes. 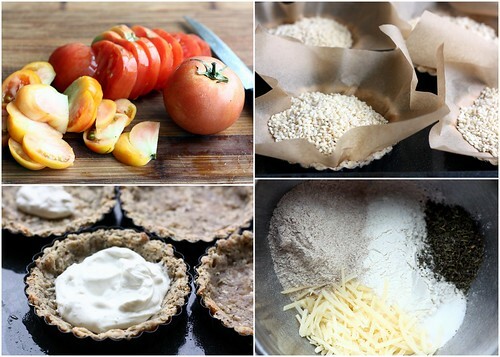 If making mini tartlets, divide the dough into four pieces. If not, keep it in one piece. Spray or butter the tart pans and, working quickly so that the pieces of butter don't melt, press the crumbly dough into the pans. Refrigerate. Heat the oven to 375F. Press parchment paper into the tart pans and fill with beans/rice/baking weights. Pierce the bottom of each crust several times with a fork. Bake for about 20-30 minutes, until the crusts are beginning to turn golden. Cool for 10 minutes. Put the goat cheese into a small bowl and add milk gradually until the mixture is roughly the consistency of sour cream. Slice the tomatoes and basil. 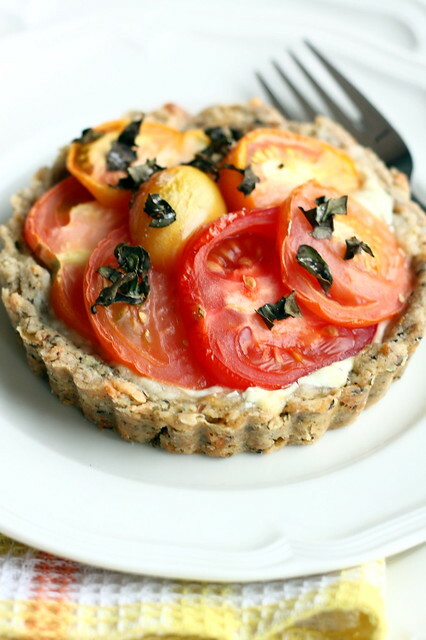 When the tart crusts are done, divide the goat cheese mixture between them and top with tomatoes. Sprinkle with salt, pepper and chopped basil. Bake for another 30 minutes. What a lovely tart you made. I also like the idea of setting yourself a budget at the farmers market. I also spend way to much. 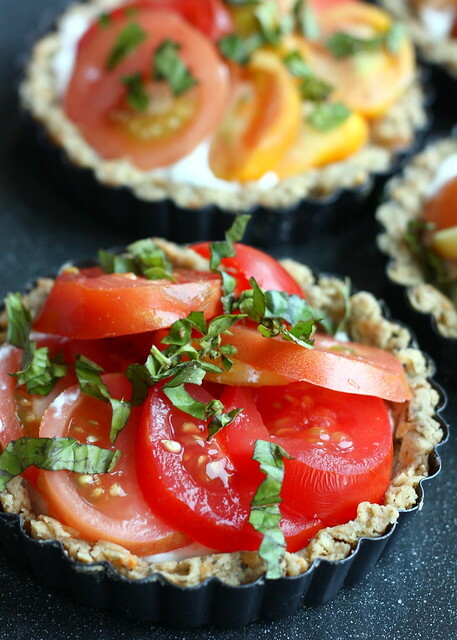 My favourite savoury flavours all in one tart! Goat's cheese is awesome! I also have trouble controlling myself around farm fresh food. The tarts you made look fantastic. Ant the photos are amazing! What a beautiful tart Irene. Love the crust and want to try it. Im so excited to make these, oh my god!!! 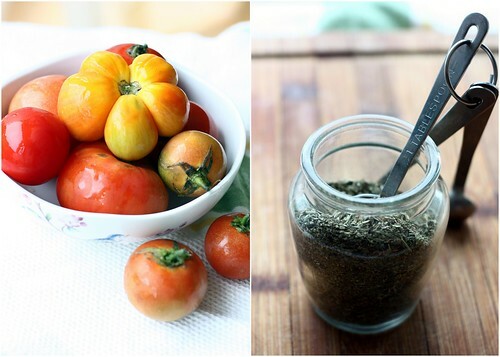 What allI'd do to get those gorgeous seasonal tomatoes from you! The tart loks fantastic!! I love tarts so much and this looks delicious. Now I need to buy some tart pans so I can make this lovely recipe. Thanks for sharing! This just looks so amazing!! I love love goats cheese! Yes, that is what I used. Maybe the goat cheese I had was more dense than yours? I used the one from Trader Joe's. I know fresh goat cheese is probably a lot softer and has more liquid. is there a substitute you recommend for goat cheese? thanks! Hm... I think any soft, mild-flavored cheese will do. Something like queso fresco maybe? I'm not sure what kind of substitute you are looking for. I just made the tart & it is fabulous! I am so pleased. I'm making another batch of mini tarts right now & using left over Boursin. Thanks for the recipe & photos, fabulous!